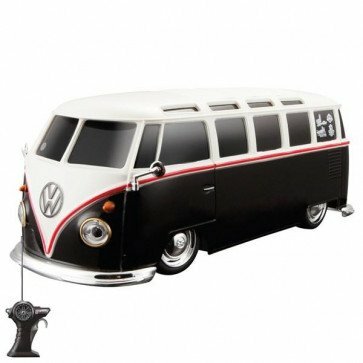 Highly detailed remote control model of a Volkswagen Samba Van. Recreated in the popular 1:24 scale size, this plastic replica features just as much detail as the models in Maistos Die-cast collection whilst also being a full function RC vehicle. The intuitive pistol-grip controller is easy to master and allows drivers of all skill levels to start enjoying it as soon as the batteries are installed.